– 25+ years of public relations and marketing experience counseling senior level executives at Fortune 500 Companies. 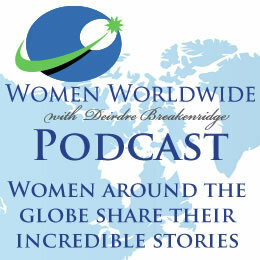 – University professor, teaching on the graduate and undergraduate level at New York University (NYU), UMASS at Amherst, Rutgers University and Fairleigh Dickinson University (FDU), who brings an academic and a business perspective to events. – PR and marketing influencer recognized by Cision as one of the Top 50 Social Media influencers in 2014, named one of the Top 10 Engagers in 2014 by Traackr, an AirPR PRTech award honoree in 2014, and named among the Top Women Who Rock Social Media by TopRank Online Marketing 2010. 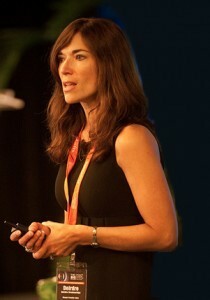 – International keynote speaker on the topics of PR, branding, marketing and social media communications. – Five-time published Prentice Hall and Financial Times Press author who has been sharing research in business books since 2000, with titles that include: Social Media and Public Relations, Putting the Public Back in Public Relations, PR 2.0, The New PR Toolkit and Cyberbranding. – Media junkie who has been blogging since 2007, #PRStudChat Twitter Community co-founder, Lynda.com video course author and Internet radio personality / host of Women Worldwide, produced and distributed by the Social Network Station. Demonstrating executive presence makes leaders stand out as inspirational visionaries that people believe in, follow and support in their organizations and communities. However, building an executive presence is not simply for your offline activities, you also need to navigate technology and social media to match your offline commanding presence to your online executive persona. If you’re a professional, regardless of your age, you need to focus on both your offline and social media persona to build trustworthy, credible and authentic relationships, share your vision and paint a clear picture for others to understand, inspire your people in different settings with your expertise, listen carefully to people and be “present” at all times and support the effort of others by giving your people the credit, when credit is due. Some professionals find it easier to be leaders offline. Other professionals feel their executive presence is more pronounced through new technologies. However, the executive that marries the offline and online world of thought leadership is the executive who gets ahead, influences others and drives important business results. Now, you can learn the steps to creating your executive presence at every single touch point. 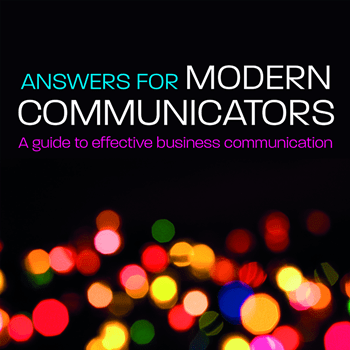 For the Modern Day Communicator, the darkest point can be the most enlightening. It was Joseph Campbell, the American Mythologist, writer, and lecturer who said, “You enter the forest at the darkest point, where there is no path.” If you’re in communications today, you may often feel this way; you’re at a point where there is no path. However, as dark or as light as your path may appear, Campbell’s quote is inspiring. Facing challenges means new adventure and from adventure comes tremendous opportunity. It’s your choice and your chance to create those fresh footsteps in the sand, in the newly fallen snow, or to create a clear path through the forest. Like anything you do in your careers or life, you have to see your “darkest” points as an opportunity to find inspiring light and an even better path or direction. Carving out the Modern Day Communicator means creating new roles, responsibilities and directions; becoming the Global Collaborator, Tech Specialist, Relationship Agent, Data Analytics Engineer and Creative Content Operator. The future of communication is not one discussion that leads to a single action, but many discussions and an interconnectedness of roles as a hybrid communication professional reaching new professional heights. And, as much as you may want to gain knowledge quickly and sprint ahead, it’s important to step back and reflect; connecting the dots that lead to more meaningful communication and shared experiences as you move along your new path. Social media has reignited the PR profession. PR professionals are reinventing their practices, as they shift from being communication facilitators and handlers to PR champions and influencers. As a result of the changing media landscape and consumers deciding how they want to gather, organize and share news and information, organizations need PR pros to take a different approach. The changes are not only exciting, but also challenging at the same time. How do PR professionals tackle these new challenges for the organization and grow in their profession? How do they continue to raise the bar and the reputation of the PR industry, as they move forward using new media? 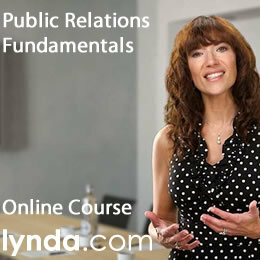 PR pros are learning new skills and competencies, as they take the best of PR past and move forward. Taking on new practices means creating a more efficient internal organizational sharing process; building stronger connections by analyzing external relationships; using technology more strategically during the communication planning process; measuring social media to be a master of the metrics, preparing for the unexpected levels of crisis and learning a best practice approach to guide all company communications. 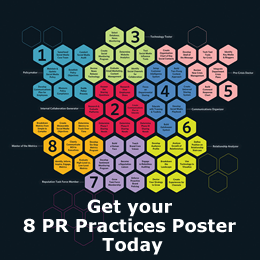 By embracing the new Eight PR practices, communicators implement better planning internally that creates deeper and more meaningful interactions externally with today’s highly engaged public. This is a revolutionary period for businesses that want to create meaningful connections and truly engage with their customers and other stakeholders. With more media outlets moving their business models online and with the growth of social media (blogs, social networks, microblogging communities, podcasts and video sharing sites, etc.) the options of where to go with your business story can be truly overwhelming. Welcome to a new age PR and communication, where you need a different roadmap to relationship building and a more customized approach to sharing stories and experiences. The challenge facing PR professionals and companies alike is how to combine the best of both the old and new worlds of communication, with today’s social media landscape, reaching a new set of influencers and citizen journalists. By building relationships that focus on two-way conversations with new influencers, trendsetters, media, and customers directly, professionals are able to bring the “public” back into public relations, with an entirely new level of results. It’s the socialization of media and the humanization of communication that transform the way communication professionals need to think, plan and prioritize. Building relationships in the digital age means developing the relationships that matter, and reaching a new generation of influencers, leveraging different social media platforms and channels, becoming immersed as a digital sociologist in the communities that are shaping the future, and learning how new, intelligent, and socially rooted PR will transform an organization into a proactive communication powerhouse, with its highly involved and dynamic public. Creating employee advocates and building an army of champions starts with good communication on the inside of your organization. 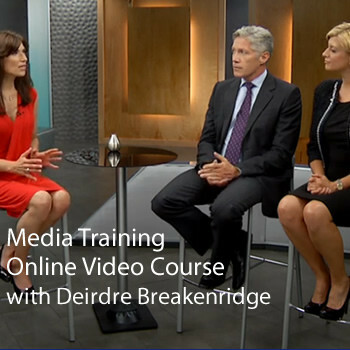 Your employee champions need brand education, social media training and communication guidance. Today, public relations and marketing professionals are working on internal company programs to promote “Living the Brand” in order to help protect and support the brand. Companies must develop internal programs first to reward good “on brand” behaviors, from the physical work environment to social media communities. Building your employee champion base means learning to identify passionate ambassadors and then growing your champion base as a grass roots effort. When you start on the inside, your champions will grow and support you in all of their communities, including social media. When you inform, educate and support your own people, it shows in your external communication with the public. With powerful monitoring and social media intelligence tools, pulling and analyzing large sets of data, i.e. “big data,” is seen as the future of communication. However, using the information to create actionable insights has been a challenge for communication professionals. Using big data to enhance the results of your communication programs means learning how to leverage data as competitive intelligence during the public relations and social media planning process, delivering better results through actionable insights during a crisis and quickly neutralizing a damaging situation, creatively driving campaigns through social channels, tweaking the program in real-time for greater engagement, and being innovative with data to entice the media to share your business stories. The discussion about big data will continue for many years to come. Data is the future of communication. Whether we call it big data or smart data, it is here to stay. When communications professionals understand the value of data and roll up their sleeves to experience PR and big data firsthand, then they too will be using smart data for better public communication.